It's funny how fondly we look back at classic ads—print, commercials, anything—compared to how we react to ads today. That Apple 1984 commercial? Perfection. Those old VW Bug print ads? Soooo cute! Today? Ew banner ads. Ugh Flash. ZOMG what happened to my ad block!? There's no room for art in advertising anymore because we've all been conditioned to ignore the pixels dedicated to advertisements. Or from another perspective, ads are so tainted because they're all plastered with social media links that we can't take them seriously anymore. Dublin copywriter Eoin Conlon played with the idea of classic ads versus current ads by imagining how those famous ads of yesteryear would look like today, which means what it would look like on the Internet. 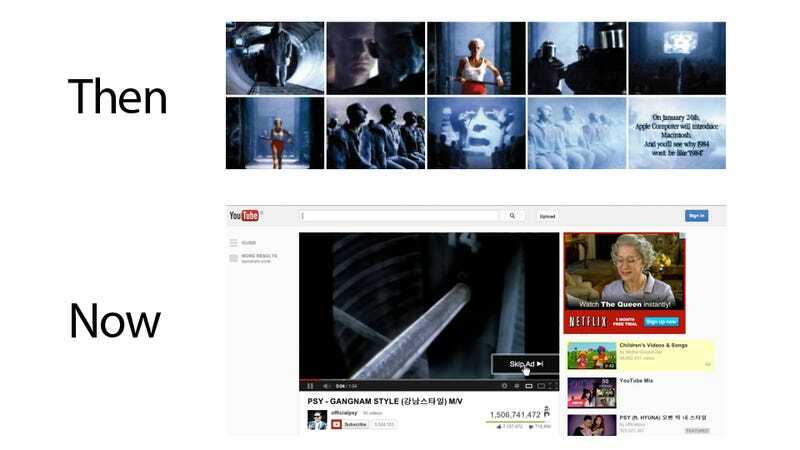 That Apple 1984 ad we breathlessly talk about? We'd totally skip it on YouTube to watch Gangnam Style for the billionth time. Those VW Bug ads? Yeah VW would totally add social media tags and QR tumors linking to all their different pages. It's a mess! Maybe advertising companies need to bring it back to the old days where the ads just stood for themselves. It's not an ad to get you to Like the Facebook page, it's not an ad to force you to autotweet some inane hashtag to your followers, it's just an ad that you'll just remember (instead of blindly hate). You can see more of Conlon's work here.